Paymaster Truck Now On Display! The Iowa 80 Trucking Museum now has a Paymaster Truck on loan from the American Truck Historical Society for a limited time. There were only 14 Paymaster Trucks produced from 1970 to 1980. 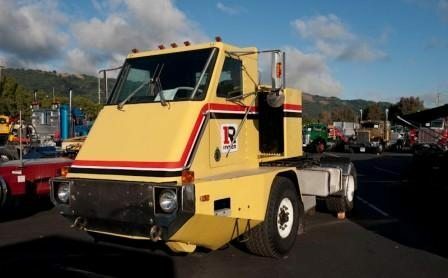 This specific truck is one of 10 that were produced for Ryder, between 1974 and 1975. The Paymaster was designed to be more versatile, improve the ride for the driver, and reduce labor costs through a simpler engine design with easy to replace components. The unique look of this truck was designed to be more aerodynamic and succeeded in reducing fuel costs by 40%, over other work trucks of the same time period. The Paymasters only had two axles but could do the same work and haul the same payload as a standard 3 axle truck. The low numbers of Paymaster Trucks produced makes this truck extremely rare, and the Museum is so glad to have the opportunity to display it.